New Radiant's Ali Fasir (30’) and Ali Ashfaq (47’) ensured that Bengaluru FC succumbed to their first defeat in the 2018 AFC Cup by a score of 2-0 at the National Stadium, in Male. The win for the Maldivian side leaves Group E tantalizingly poised as both teams sit on 9 points with two games left. 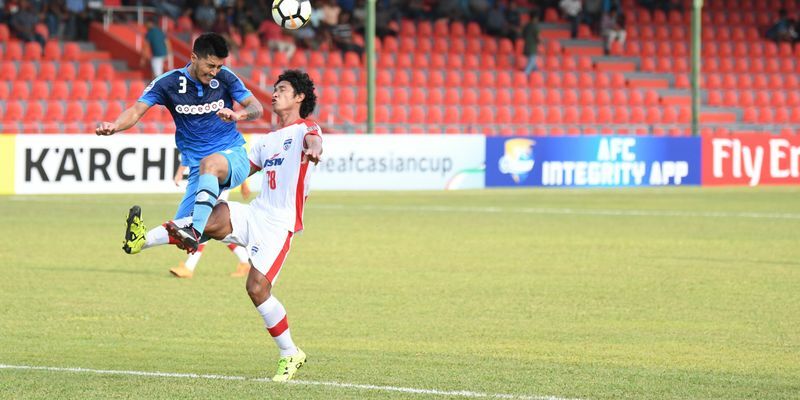 In the other Group E game, Abahani Dhaka were held to a 1-1 draw by Aizawl FC which leaves all to be played for in the final two rounds of the South Zone. Eduard Gasol took charge in the absence of the suspended Albert Roca as the Blues made seven changes to the starting XI with Juanan, Rahul Bheke, Subhasish Bose, Victor Perez, Lenny Rodrigues, Udanta Singh and skipper Sunil Chhetri all returning to the team. Bengaluru, who looked jaded and a shadow of the team that triumphed in the Super Cup back home last week, went behind in the 30th minute after Fasir finished a move down the left with a strike past Lalthuammawia Ralte to make it 1-0. Chhetri had a chance to level things in the 36th minute when he found himself through on goal. But ’keeper Mohamed Imran made himself big to deny the Bengaluru skipper. With a suspended Roca passing instructions to the bench from the stands, Bengaluru started the second half with two changes. Paartalu and Lenny were pulled off for Malsawmzuala and Boithang Haokip as the Blues looked to find a way back into the game. But the charge suffered a heavy dent soon after the restart when striker Ali Ashfaq capitalised on a defensive blunder to give the hosts a two-goal cushion. Struggling to keep possession of what seemed like a routine pass, Bheke was stolen by Ashfaq who wasn’t going to squander the chance to score. Bengaluru continued to toil under the sun and looked like in danger of falling back further if it hadn’t been for some brave goalkeeping from Ralte. The Bengaluru ’keeper kept lending his attack an opportunity to claw back into the tie, making some vital saves in the second half. With a little more than ten minutes to the end of regulation time, Bengaluru made their final change, bringing Daniel Lalhlimpuia on for Thongkhosiem Haokip who didn’t have a game to shout about. The last ten minutes didn’t produce much chances for the Blues who suffered their first defeat in the competition since the 1-0 away loss to FC Istiklol Dushanbe in the first leg of the Inter-zone Final in the 2017 AFC Cup. Bengaluru will go on to host domestic rivals Aizawl FC in their next game on May 2 at the Kanteerava Stadium.